What a week! What a GOD! #Repeat - What a God! I have never had such fun and enjoyed so many "teenagers" at once! If you know anything about my journey...I came to faith ten years ago, so there was no children's church, youth group or camp. Just look at God, giving me a chance to #experience what I missed all those years...way back there! I had the sweetest and most humbling privilege to chaperone our youth at this year's Momentum Conference in Marion, Indiana. GOD was there and wow! If you've never been, go to their web page and see what you missed, yes...even #grownfolks. Although the week is a conference for our youth, if you are in Christ....#pause---even if you are not in Christ, there is still something to be learned, gained, renewed and delivered from! What a God! Buildmomentum.org! And if you don't know, if you've never tried it and if you've ever had any doubt...#PrayerWorks! In the precious and matchless name of Jesus Christ, prayer works! I saw it with my own two eyeballs! To God be the glory! It is my prayer that as you visit with me, you will find a small piece of yourself in something I’ve written. And as a result of that word, sentence or quote…your heart will find clarity, healing, restoration, forgiveness, love, faith and ultimately peace in Him. My first self published book! Thank you for stopping by. Please feel free to "share your thoughts" or just sit back for a minute and read mine! I hope that something I say here awakens your spirit! If you're Passionate about Poetry meet me over at my other blog (Poetry and Prose). Aside from "Loving Christ, my Lord & Savior," that's where my true passion lies. I pray that you enjoy your visit! Love, peace and blessings - A free spirit butterfly! I'm on a journey of self discovery and I'm excited to see what the future holds for me! Books that have contributed toward my personal growth. 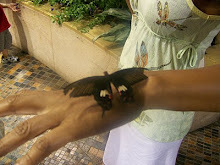 All words of poetry, prose and haiku are copy written by this blogger, free spirit butterfly!. Travel theme. Powered by Blogger.